When it comes to providing opportunity to veterans and transitioning servicemembers, the world's largest paint company offers them a career opportunity that covers them for life. 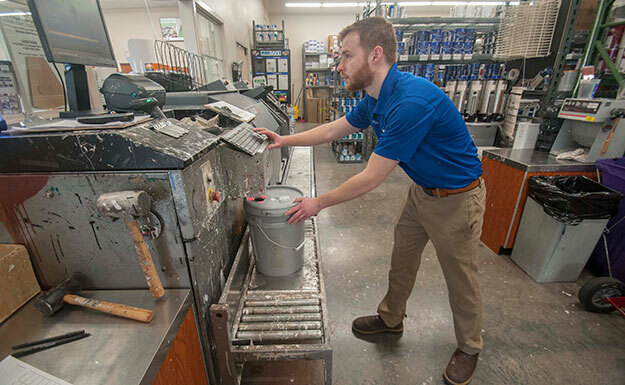 "Sherwin-Williams is a loyal company to its employees, and veterans are loyal people," wrote Ryan Sanders, the store manager of the Lakewood store. An eight-year Army veteran, he served as a nuclear, biological, chemical warfare specialist with the 1st Infantry Division. "The company looks for hard-working, driven, competitive, honest and ethical people, and I think veterans mirror those qualities." Sherwin-Williams will take part in Northwest Military's Dream Big Career and Education Fair, Saturday, April 13, from 9 a.m. to noon at the LeMay Marymount Center in Spanaway. Founded in 1866 by Henry Sherwin and Edward Williams in Cleveland, Ohio, the company today has approximately $16 billion in sales, more than 4,100 stores, over 60,000 employees and 140 manufacturing and distribution centers worldwide. "Because the company has as many locations as it has, it is able to accommodate relocations, something that veterans are familiar with," continued Sanders. He also pointed out that approximately five percent of Sherwin-Williams' employees are veterans, that more are being sought as employees, and that a significant number of the spouses of veterans are also employed. Sanders is a good example of Sherwin-Williams' commitment to hiring, training and retaining employees. "I started at an entry-level, part-time position and worked my way up to full-time," he began. "I then became an outside sales representative, and now I manage my own store. Ninety percent of all promotions at Sherwin-Williams come from within the company." Sanders also began a Veteran's Committee while working in Seattle, and it caught the attention of the city manager. "Veterans like Ryan are leaders, and they are the ones who take on roles and relish being an asset," Zack Melnick said in a press release. Veterans weighing the option of working for the big paint company can expect good wages, full medical benefits and performance bonuses. As to career progression, there is no upper limit. "There are a multitude of career paths with Sherwin-Williams," continued Sanders, "and everything is in-house from manufacturing, distribution, research and development, and marketing, to name a few." Veterans who enter Sherwin-Williams' Veterans Management Training Program can expect accelerated career advancement. "This is a great opportunity for veterans to work for a great company and take care of their families for both the short and long-term," concluded Sanders. "This is the company I expect to retire from." For more information, visit: sherwin-williams.com/about.